"Long-time home of Green Gables author finally emerging from years of disrepair"
Construction on the set for Road to Avonlea started in the summer of 1989, on the former Robert Nesbitt farm on the 6th Concession of Uxbridge, Ontario. The Nesbitt house and barn on the property became the King farm buildings in the series. All the other buildings were just "shells" or "fronts". 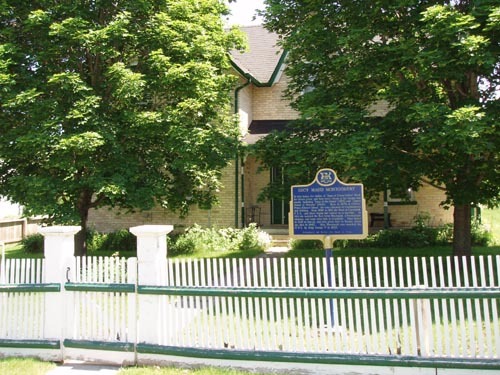 Not only the most exterior shots were done in Uxbridge, but three of the books used as background for the show were penned by Lucy Maud Montgomery in her Leaskdale Manse (Leaskdale is one of the 8 hamlets in Uxbridge Township). The 1995-1996 season was the last one for Road to Avonlea, and the set, except for original buildings, was demolished on February 14 and 15, 1996. 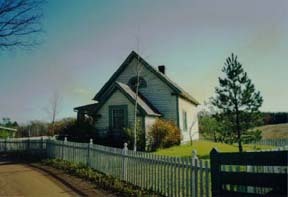 The Pine Grove Church on the 7th Concession of Uxbridge was used in several Road to Avonlea episodes including the last show. © 1996-2009 - Uxbridge On-Line Inc.